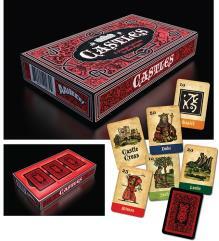 In the game of CASTLES, two players compete across the gaming table to build a Kingdom of cards. As each player takes a turn drawing from the deck, you'll seek to gather the support of Dukes, Counts and Barons, and attract Champions and Wizards to your Court. As you rise in power, your Nobles acquire Lands and Serfs, you'll add a Wife and Heir to your throne, and move slowly toward becoming the most powerful Kingdom in the land. But wait... your opponent works to undo all you've built, and you face opposition from his Minions and Magick spells, and are forced to Wage War with your Generals and Arms to seal your legacy in stone. In the end, only one CASTLE can prevail! Fast paced and fun, the game is quick to learn but challenging to play. While a session can be over in as little as 30 minutes, aggressive play and thoughtful strategy will keep you on the edge of your seat in game after game! » Browse other products by AAIIEEE!